You are looking for a holiday apartment in the Hunsrück region? Visit the lake-side holiday home in Kastellaun! It provides enough space both within the house as well as on the furnished terrace from which you have a beautiful view onto the picturesque Kastellaun lake. On the ground floor, the holiday apartment offers approx. 100 m² living area and room for up to 5 persons (2 bedrooms, bath, guests-toilet, kitchen, large sitting room). The kitchen is well equipped including microwave oven, dishwasher and freezer. The attic flat has a size of approx. 50 m² (2 bedrooms, sitting room and shower-bath) and offers rooms for up to max. 3 persons. It can be booked in addition to the ground floor appartment (more than 7 persons on request). 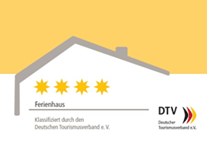 We are pleased about the 4-star classification of our apartment by the Deutschen Tourismusverband.